Yes the flare of the Packing Cup faces down. IF you remove the Top Cap for any reason, you should be replacing ALL of these O Rings. I get so many "help me" e mails from people who "changed the top seal" because it was leaking. No, you changed the Wiper, and disturbed all these other O Rings, and then did not change them, and NOW your plow won't stay up. THIS is why. If you are removing the Top Cap for ANY reason, you need a Basic Seal Kit to put it back together, PERIOD. 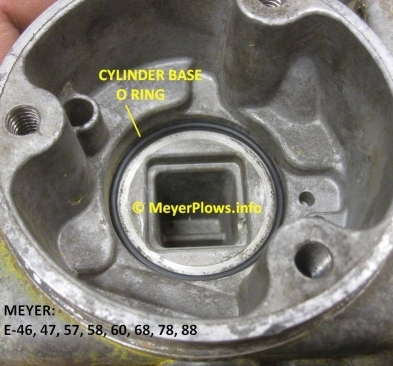 The above Sump Base picture is an old cracked base, but, note there is no Strainer in it. IF you take yours apart, THROW AWAY the Strainer. It is far worse to starve the Gear Pump of oil due to a blocked strainer than to let anything that is inside the unit go through the steel gears of the pump. There is a filter on the discharge side to catch debris. 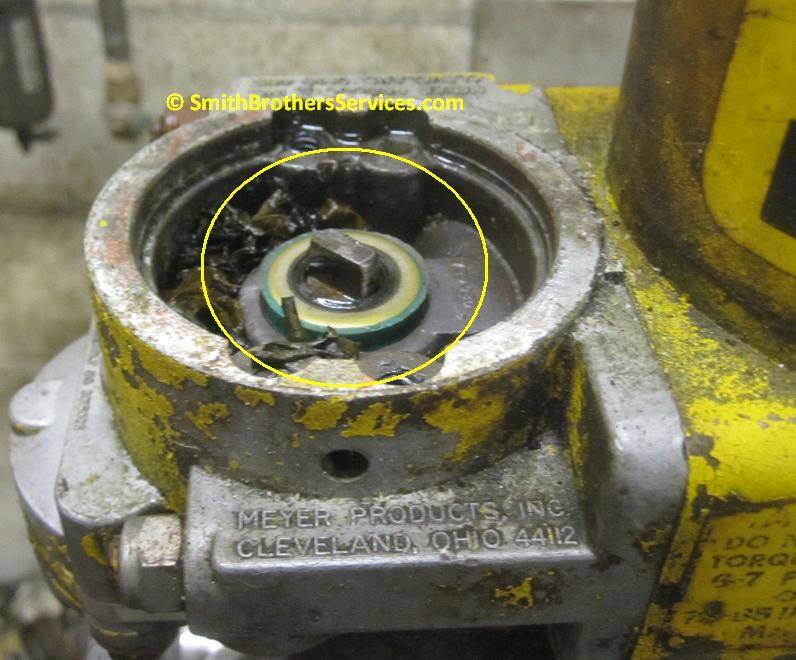 Take note, the E-60 NEVER had a Strainer in it, with no ill effects. Lets have a look. 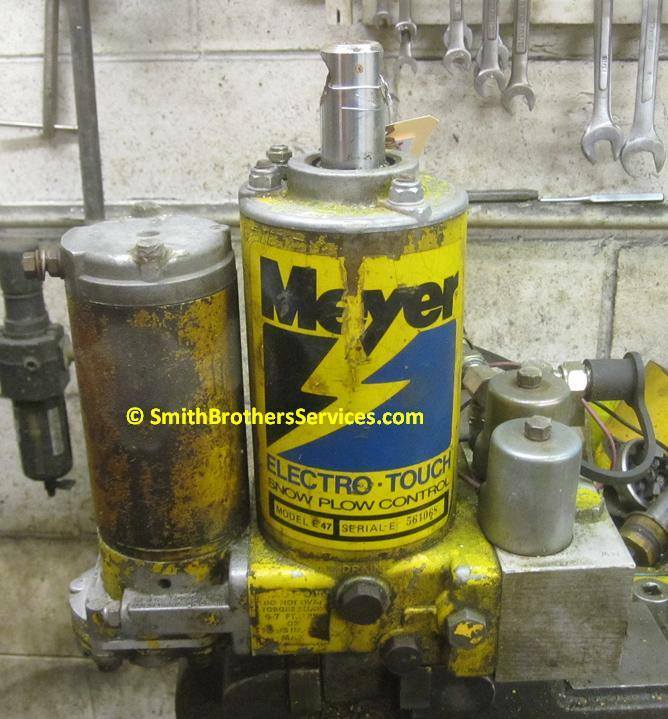 Pump is from 1984 according to the date on the motor. a lot of use. The customer uses it to move round bales in the summer. A rebuild kit like no other! We put together the most complete kit for the E-47 Meyer Snow Plow Pump you will find anywhere. 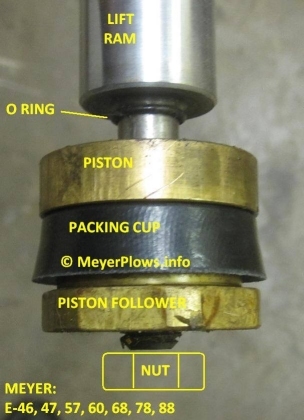 Master Seal Kit contains all O rings and seals for Meyer E-47 and E-57 units. Valve O Ring kits included fit E-60 as well. Includes Pump Shaft Seal. Save $4.99 buying these parts as a kit vs. separately! Genuine Meyer E-47 E-57 Basic Seal Kit - Fits E-46and E-58H pumps too.